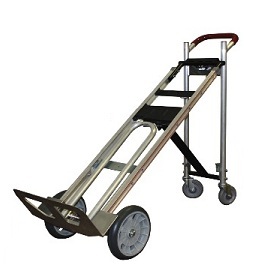 The Liberator 3 way hand truck brings you all the benefits of a convertible hand truck, with the additional 45 degree capability. Allows access into elevators, hallways etc. where traditional platform carts won't fit. Ideal for bottles water deliveries, ice companies, and other delivery professionals.